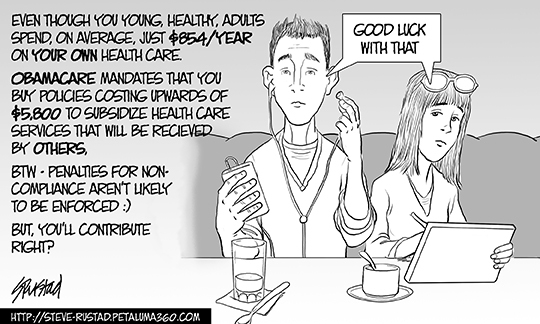 Young People Will Foot the Bill for Obamacare. The Achilles heel of the “Affordable Health Care Act,” (written in haste, read by none before it was passed into law, and destined to be litigated for the foreseeable future) is the provision that mandates that young people who don’t need health insurance will buy it so that older people care can get health care cheap. I wonder what will happen when that huge cohort of well-educated and underemployed youth figure this out and decide not to bail out the geezers who saddled them with this bad deal.